"Elvis" donuts from Dottie's Donuts, with banana, a cashew butter glaze, seitan bacon and a milk chocolate drizzle. Great news for a misty, hum-drum afternoon: two new pick-me-up spots just opened in Philly, albeit on opposite sides of town. River Wards Cafe in Port Richmond flung open its doors March 11 to the Port Richmond neighborhood at 3118 Richmond Street. They're serving up ReAnimator coffee, Au Fournil pastries and Center City Pretzel Co. soft pretzels; the soft pretzels are a nod to owner Joe Livewell's Fishtown upbringing, he tells Eater. At first, they're open just 8 a.m.-3 p.m. but they expect hours to expand soon. 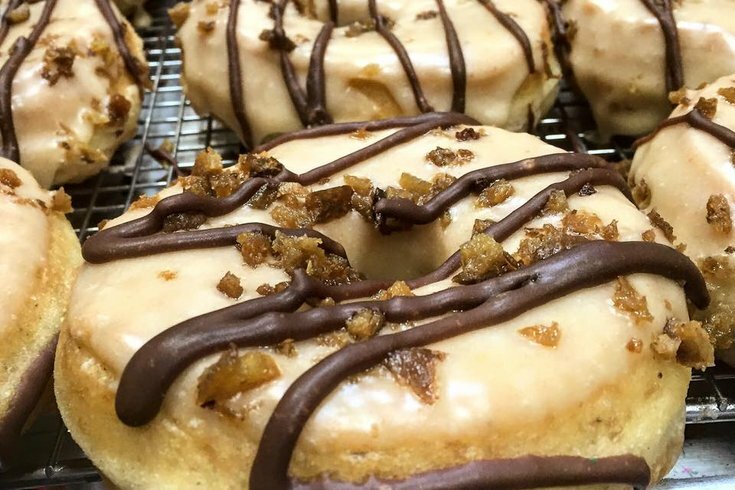 Meanwhile, Dottie's Donuts, the popular vegan sweets maker which has been delivering its goods across town for some time now, has finally opened its brick-and-mortar just off Baltimore Avenue. Technically they're in soft-open mode at the moment at 4531 Springfield Avenue, with hours just 7 a.m.-3 p.m., but as of March 18, they'll be officially open for business. Live nowhere near Dottie's new locale? They distribute to a ton of local cafes, including the newly opened Rally Cafe in Queen Village.